Target Archery in the UK is organised in a pyramid structure. Archery GB (GNAS) is recognised as the official national governing body for the sport in the UK by the International Olympic Committee (archery is an Olympic sport). GNAS lays down the rules of shooting for archery, trains archery coaches and judges, provides a system of scoring, handicaps and national records for tournaments, prepares archers for international competition, arranges public liability insurance for all its members, of whom there are currently about 45,000. GNAS’s motto is UNION, TRUEHEART, COURTESIE. There are nine Regional Organisations, numerous County societies and about 800 clubs. 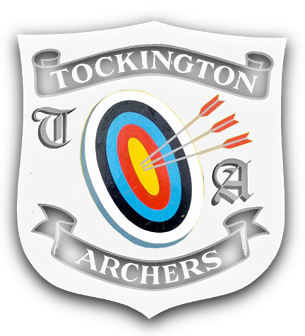 Clubs are required by GNAS rules to affiliate to their County, Regional and National bodies, hence Tockington Archers is affiliated to Archery GB (GNAS), the Grand Western Archery Society (GWAS) (our Regional organisation) and to the Gloucestershire Archery Society (GAS) (our County organisation). Target Archery is the most popular form of archery, in which members shoot at stationary circular targets at varying distances. All types of bow – longbow, barebow, recurve and compound – can be used. Field Archery is the format of modern archery that takes place on a multi-target course (often compared to a golf course) set out over all kinds of terrain including fields, woods and forests. International field archery includes three bowstyles: recurve, compound and barebow. Clout Archery is a form of archery in which archers shoot arrows at a flag (known as “the Clout”) from a relatively long distance and score points depending on how close each arrow lands to the flag. “Archery UK”, the official magazine of Archery GB, is posted to all members directly. Current and back issues of the magazine can be found on the ArcheryGB website. There are other archery magazines (e.g. Bow International) which can be bought by direct subscription or from archery retailers. It is also possible to buy USA archery magazines.